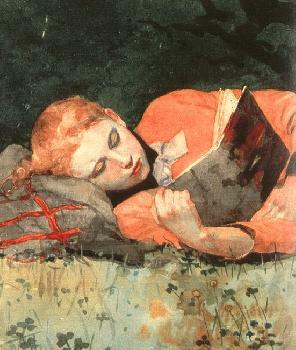 Winslow Homer, 1836-1910, another of America’s famous artists in art history, began his art career apprenticed to a lithographer at the age of nineteen. Periodically he submitted wood engravings to "Harper's Weekly", and didn't begin painting oils until 1862, at the age of twenty-five. After Winslow Homer finished his art apprenticeship as a lithographer he was hired as an illustrator in New York for "Harper's Weekly". The process of art engraving was new to him. Color was not used in the engraving process therefore three dimension was difficult to achieve. Depth dimension and value gradations of the color black could only be achieved through rough crosshatching. Depth recession was also built working on a shallow foreground plane emphasizing the play of large figures in comparison to smaller figures placed directly behind. Recession could also be achieved a by blurring or softening the smaller figures or objects directly behind the foreground primary figures. One of Homer's early and most famous paintings is "The Morning Bell" painted in 1866. The composition is remarkable in with its strong diagonal emphasis on the wooden ramp, a possible influence from Japanese prints. The art is equally remarkable in its luministic rendering of details. Winslow Homer was an individualist. His advice to artists was to never look at another artists' work and therefore not be influenced away from their own direction. In one of Homer’s engravings "A Parisian Ball-Dancing at the Casino", 1867, Homer experimented with pictorial simplicity in the engraving process. He found strong lines could be used in art to create power and emotional effect contrasted with bolder shadows. Influenced in his early days working with woodblocks, Homer continued to place his figures in a tight foreground frieze-like composition, even though his medium had changed to oil in the painting "Prisoners from the Front", 1866. The two main figures are dark and bold, silhouetted against a softly rendered group of shallow background figures, contrasted against a brightened sky. Character and personality of the main figures is achieved in the detail of the clothing they wore, and unusual for Homer at this time, he rendered some emotion in their faces. Homer's art was from a detached point of view; he painted reality only as he saw it." Prisoners from the Front" was the most popular painting produced during the Civil War period. People didn’t see the North against the South in Homer’s artwork; they viewed the figures together as a brotherhood of man instead of combatants in war. Winslow Homer maintained an interest in American country life, and was attracted to the lightheartedness of children at play in works such as his famous painting "Snap the Whip", 1872. His desire for order and detail shows in a usual diagonal composition, even the knees of the children are in relative order. Homer was a realist by his own admission, he painted nature exactly as it appeared, but did not mimic nature. Searching for a way to generate more income from his art, Homer turned to watercolors. In 1880 he painted "Gloucester Harbor" an impressionistic painting surprisingly close in style to those works painted by famous Impressionist artists in Europe. He found through watercolors a way to render quickly the immediacy of nature and its subtle effects. Winslow Homer traveled to England in 1881 and was influenced to paint scenes of fishermen earning a living on the raging seas. Returning to New England he sailed with a native fishing fleet, later painting scenes from this sailing experience. In 1884 he painted another of his famous paintings "The Life Lines". The art is an emotional drama of two sailors transferring from an unseen wrecked ship to the safety of another ship also not seen. Homer realized that not painting the two ships heightened the drama and the immediacy of a moment in time. Winslow Homer intended the viewer to see and feel in his art, all the dramatic emotion of the moment from an impersonalized point of view, a characteristic he continued to use almost for the rest of his career. Homer’s impersonalized point of view made his genre paintings more universal than the American Native School painting, and easily acceptable by a greater public. In 1899 Homer continued to paint dramatic genre. He painted "The Gulf Stream" a work recalling another famous painting in art history, "Watson and the Shark", painted by John Singleton Copley in 1778. Homer’s art painting is almost sublime in character; man fighting against nature to the finish except for the fact that Homer’s figure is almost inert sprawled out on the boats deck waiting his demise from the approaching waterspout and or the circling sharks. American Native School art usually avoided the ugly and harsher reality of life. To Winslow Homer, "The Gulf Stream" was the reality of all life in nature. Animals attacked animals in nature and human beings. Weather could be devastating at any time. These things were a reality in the world and because Homer was a realist, there was beauty in these things. Other famous artists of the realist style are Thomas Eakins, and John Singer Sargent.